Holiday shopping comes with its own set of challenges for the gluten-free shopper. It’s that time of year when everyone could use a few more hours in the day to get it all done. We hit the ground running every day. In and out of malls, before and after work, and/or in between dropping the kids off at school. And, if you’re like me…..almost always avoiding the food courts and snack carts. You only need about 5 minutes to start the day off right! 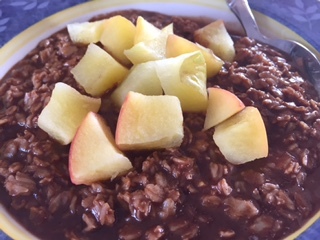 Our Gluten-Free Prairie Toasted Oatmeal pairs up with pure dark chocolate – to create a high protein, fiber, B-Vitamin fullfilling breakfast treat. TIP: While the oatmeal is cooking, cut up an apple (with skin), cook in the microwave for 2 min. Like eating Chocolate Fondue for breakfast.